Shooty Fruity released late in 2017 for the home HTC Vive headsets worldwide to critical and commercial acclaim. Developed by nDreams, it features addictive multi-tasking shooter gameplay – a mash up of the likes of Space Pirate Trainer and Job Simulator but with an anarchic and juicy twist! 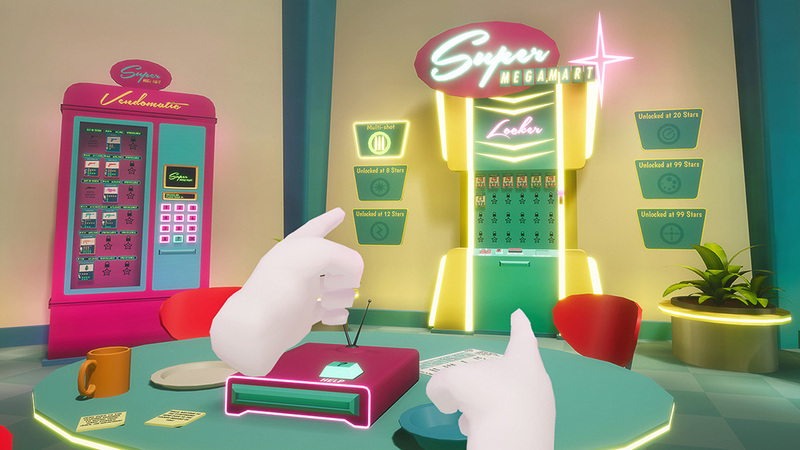 Recently, nDreams brought their creation to VR arcades in an all new exclusive version. Here, the team take us through the creation purpose of this edition of the game. Here at nDreams, we have spent the past 12 months carefully watching the VR Arcade sector grow from strength to strength and fast become one of the key areas of the VR market. 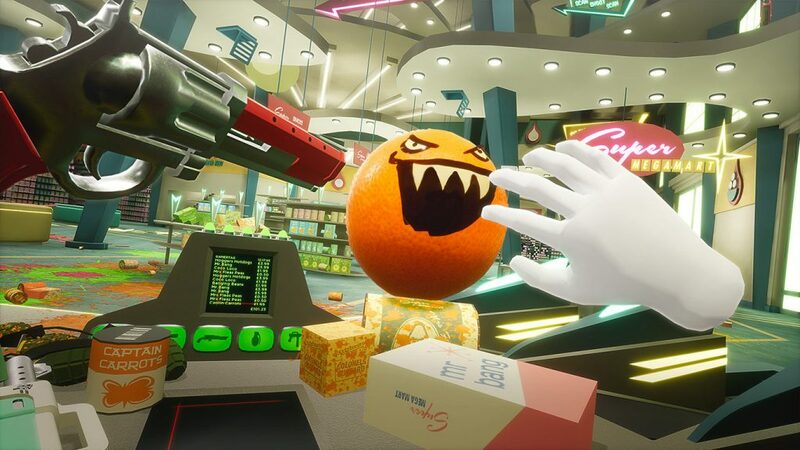 However, from our extensive conversations with leaders in the field, we knew that if we were to bring Shooty Fruity to the arcades we would need to take a fresh look at how to make it as suitable as possible for what is very different to home VR – from different audiences and player behavior, to logistical set up, staffing considerations and business model. 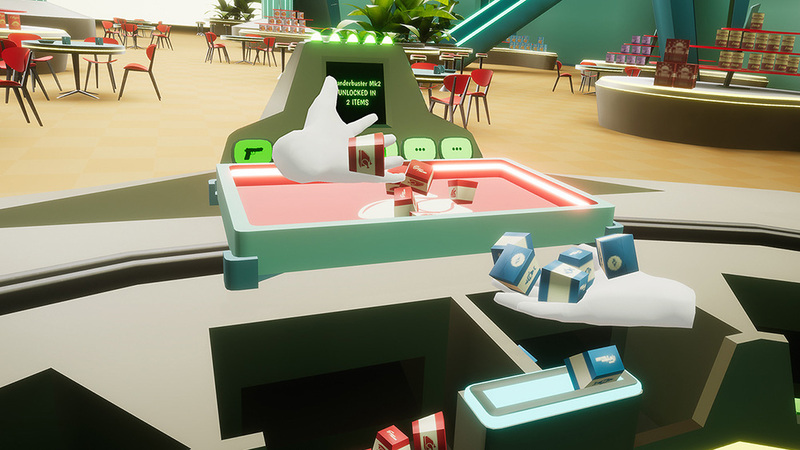 The first thing that became apparent is how the core elements of the game fit perfectly with things integral to the success of an arcade VR title. Firstly, Shooty Fruity has simple controls and intuitive actions, it’s addictive and fun with a real ‘just one more go’ feel… The simple shooting and scanning, along with a depth of mastery needed for shooting accuracy, multitasking, duel wielding and so on gives it a simple to learn yet hard to master feel, which is perfect for arcades. Additionally, an engaging and accessible premise is really important if you want to target a much wider audience beyond the home consumer. 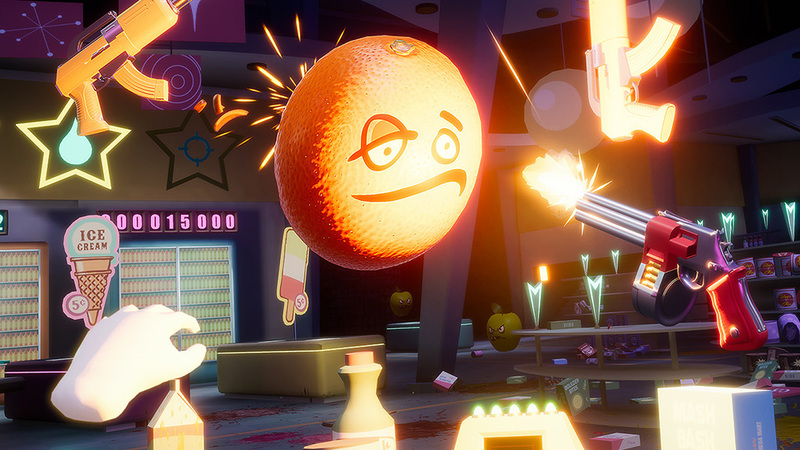 The humorous supermarkets-meet-guns and gratuitous-yet-juicy violence balance nicely between what appeals to adults and kids. Finally, the polished graphics, carefully balanced gunplay and a full games worth of guns, fruits and jobs gave us the breadth and production values that you see on many of the leading VR arcade titles. Despite all the strengths of the game there were clear areas where Shooty Fruity could be refined for arcade environments. How does that work for the arcade player? Simple and immediate ‘onboarding’ for new and returning players. The staff room of the home version of the game is great for long play sessions, but not if you’re paying by the minute – you want to get in and be playing as quickly as possible. Scalable play sessions – even a 10 minute game should be fun, rewarding and self-contained. While individual rounds in the original game can range from a couple of minutes up to 10-15 minutes, it was designed to be played in longer sessions. Keeping players coming back again and again – the gameplay naturally had the depth to do this, but what else could encourage it? Simple instructions – onboarding takes less than 30 seconds and puts focus on the most important things – how to grab, how to shoot, what the objective is. No need for an attendee to set up, demonstrate or explain to the player! Branching arcade structure – across a roughly 10 minute play-through everyone plays three shifts with which ones you move onto being dictated by how you do. Getting your head around your first time in VR? You’ll move onto more forgiving shifts. A VR shooter pro on your 5th play-through? You’ll have the opportunity to play more complex and unforgiving levels. You want to play again and again – the branching structure isn’t the only reason to have that one more go, level challenges boost your high score and those high scores can be viewed in weekly, monthly and all time leaderboards, giving a reason to keep returning to try and top the boards. From feedback and data from our initial launch, we’re delighted with how this version has been received by partners and players. However, we see this as the first step along a long road for Shooty Fruity Arcade. The same feedback and data points to areas which can be expanded and refined over time to make an even more compelling experience for players to enjoy well into the future. Shooty Fruity is available now in both arcade and home versions on Viveport and via Viveport Subscription. For more details about the game and nDreams’ future titles be sure to check out their Twitter.